PARIS, Jul 3, 2014/ — Last Sunday, 29 June at the Couvent des Cordeliers in Paris, Yohji Yamamoto and adidas present the Y-3 Spring/Summer 2015 collection. Taking a bold direction this season, Yohji Yamamoto took the path of pure in its pursuit of escape and athleticism with surf subculture as a big influence. Men’s and women’s pieces debuted together in a vibrant, colorful, and technically accomplished aesthetic influenced by the past but set firmly in the future. At its origins, surf culture was unique in its challenge of the mainstream, eschewing convention and the status quo in favor of the next big wave. Similarly, Yohji Yamamoto has consistently pushed boundaries. For Y-3 this season, he envisioned slim-fit futuristic sportswear detailed with bright pops of color and playful prints—all of them finished with unique surf-inspired details and Y-3’s own take on traditional Hawaiian prints: lush, modern, and intoxicating. Such prints served as the driving force of the women’s collection, emblazoned across everything from voluminous frock dresses and easy sweats to zip-up blousons and oversize parkas. The surf inspiration was also interpreted in acid-bright ombré separates that faded from eye-popping tones of turquoise and peach to charcoal gray. 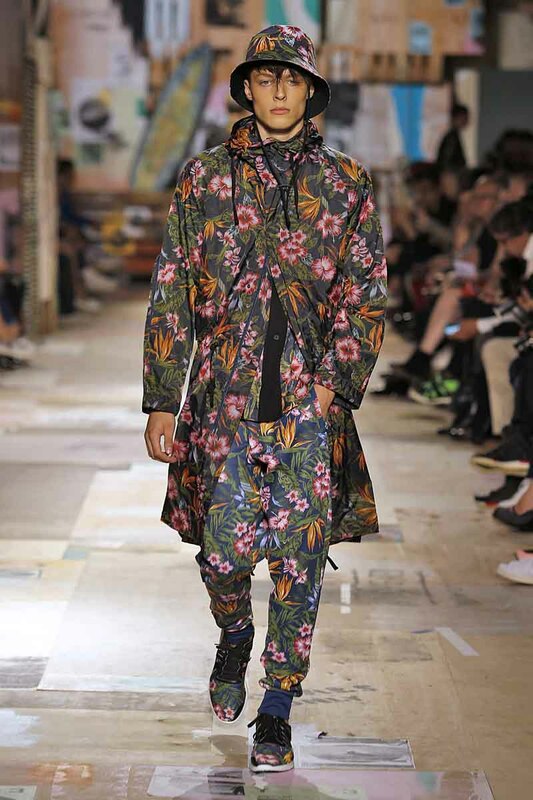 Menswear similarly explored dichotomies of printed and solid, tailoring and volume, hard and soft. Neat polos and T-shirts came trimmed with this season’s bold Hawaiian motifs. Suit jackets featured a subtle tone-on-tone version of the print, while button-down shirts introduced a playful pattern of seaside iconography from Paris to Honolulu. On the footwear front, technical neoprene came adorned in flower prints, most unforgettably in the form of a sky-high women’s wedge boot with a bold zip tracing its silhouette. adidas’ breakthrough Boost foam technology returned to the collection alongside a new range of essential trainers and slip-ons. Each piece underscored the brand’s unquestionable technical prowess while serving as a powerful ode to a pioneering surfer spirit.